Much love and solidarity to all of our comrades who have been on the front lines (and behind the scenes) actively fighting against these neo-nazi scum. Thinking of all of those who were injured last weekend and wishing them all speedy recoveries. You can find ways to donate to their medical funds by clicking here. Speaking of fundraising, dust off those running (or walking, or riding, or sitting) shoes for this years Running Down the Walls coming up on September 17th in Prospect Park! This year’s local beneficiary are NYC J20 defendants who are all facing upwards of 75 years in prison for protesting the cheeto masquerading as some kind of man with power. This week’s letter writing dinner will focus on a group of long time revolutionaries who have endured decades of violent oppression at the hands of the racist state. 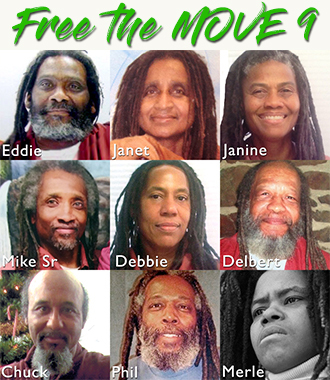 The MOVE 9 are a family of strong, serious, deeply committed revolutionaries. They are innocent women and men who have been in prison since August 8, 1978, following a massive police attack on them at their home in the Powelton Village neighborhood of Philadelphia. This was seven years before the government dropped a bomb on MOVE, killing 11 people, including 5 babies. You will notice only seven addresses below. That is because the state would rather see our comrades dead than free and allowed both Merle and Phil Africa to die while imprisoned. ¡Presente! We support the move 9 and all the political prisoner’s and p.o.w’s locked down inside the bowels of the beast. Clinched fist solidarity to all the righteous bro/sis daring to struggle daring to win. BK/NY – Tuesday, September 12th – Letter Writing Dinner for Xinachitli Illustrated Guide Version 12.6 Uploaded!